Situation A – You will be sleeping in the car. Situation B – You will transport all your gear in the car but you will not sleep in the car. B.1. This can imply sleeping in a tent close to the car. So choose a comfortable cot, the wider the better. B.2. You might decide to use a cot-tent (aka tent-cot). B.3. You might be taking shorter hiking tours and stay overnight far from the car. So perhaps you need a portable cot. Situation C – It can be a combination of both A and B. Clearly, you might need quite different cots for such situations. This is why below I give rather different tools, and I shall always point back to these separate cases and let you know for which of them a particular cot suits best. In the case A, perhaps you have a van with three rows of seats and when you remove the two rows you will have a flat floor. This was my case in the past. You can use practically any cot on such a car-platform. So if this is your situation, it may be good to use a cot which allows for storing some stuff underneath it. Therefore choose a cot which has a bit higher legs, I give some examples below. In the case B.1, you will probably have a bigger tent, so you might go for some comfortable cot, the width is usually an issue with many of them. So I give such wide options. Note, some cots come with integrated mattresses, and those can be foam or air mattresses. You can use them in the options A and B.1; I give some examples below. 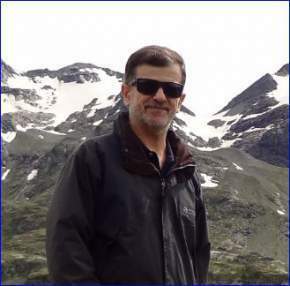 I am a mountaineer, so sometimes I take my stuff and climb up in the afternoon and set a camp at a higher elevation, at a place from where I have a shorter access to the summit. This is when I want to capture the sunrise, or simply when the climbing tour is long and I have to do so to get back in time. This is the situation described in the case B.3 above. So let me give you my list of cots and you will be able to make an informed choice. All the cots given below are described in detail in my separate reviews. In some cases, some of them are hand-picked from tens of cots of the same type, so those are representatives of different types of cots that you have here in the site. Note, this is not a ranking list, so don’t even try to compare them, rather think of what you really need. All these tools are very different and designed for different situations. I give them in alphabetic order and the numbers are just for navigation. Byer of Maine Easy Cot. This is an incredibly popular cot, and when you see how quickly you can deploy it, you will not be surprised about its popularity. This explains the word ‘easy’ in its name. This cot is from the group of collapsible cots here in the site. This is a steel construction, very strong and durable, and its dimensions (L x W x H) are 78 x 31 x 18 in (198 x 79 x 46 cm). So the size is great and you have a lot of clearance underneath you. As I said, there is no assembly here, just open it in one simple move and it is ready. It comes with a very affordable price tag, and this is a product from the company that was established in 1880, believe it or not. I see this cot as an excellent choice if you change the place frequently and sleep in the tent. The setup cannot possibly be easier than this. So this is a great tool for the case B.1, but it is also very much suitable for the case A, with the case C naturally included. Byer of Maine Heritage Cot. If you are puzzled about the reasons for having this cot here, just look at its materials. This is the only cot here built from wood. 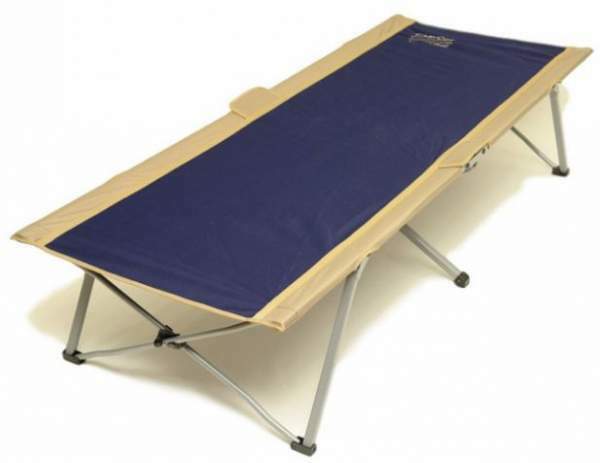 In fact, I do not remember seeing any other wooden collapsible camping cot on the market. So in view of the wood used here, which really looks pleasant, this is also a nice option to have as an extra spare bed at home as well. But if you are not interested in the wood, just ignore it, you have plenty of other options in the text. The style of the cot is obvious from the picture, this is a typical X-frame military style cot. But its dimensions are truly impressive. So you have (L x W x H) 84 x 30 x 18 inches (213 x 76 cm x 46 cm). I see this as a nice cot for the case B.1., and also perhaps for the case A if you have a big car. This Chinook is one of the padded cots here in the list. So in most situations, you do not need any insulation under your sleeping bag. As the name suggests, this is a heavy-duty item with a welded aluminum frame and 375 lb (170 kg) weight capacity. The cot is extra wide and very long with the dimensions 80 x 33 inches (203 x 84 cm). Note also that it is quite high, 20 inches (51 cm) so you can store lots of gear underneath it. This is useful if you use this cot in a tent. You have a reclining backrest as you realize from the picture, and the legs are also adjustable. This is a car camping cot from the group B1 mentioned above, so you would transport it in the car but sleep in the tent. Please follow the link for more. There are several reasons for having this cot in the list. The first is that it comes with a mattress included. So you have 1.75 inches (4.5 cm) of foam insulation under you, and this all comes with a very affordable price tag. This is a folding cot, so you have no assembly here, just unfold together with its mattress and your bed is ready in seconds. Its dimensions are 80 x 30 x 15 in (203 x 76 x 38 cm), so you have lots of space for you and also under the cot to store your gear and to save some space, either in the car or in the tent. This is a tool for the cases A, B.1, and C. Its legs are bars, so if used in the car it will fit only if the car floor is completely flat. Nothing can go wrong with this cot, it has been on the market for some time already and it is very popular. If you need a smaller size, no problem they have a shorter version. 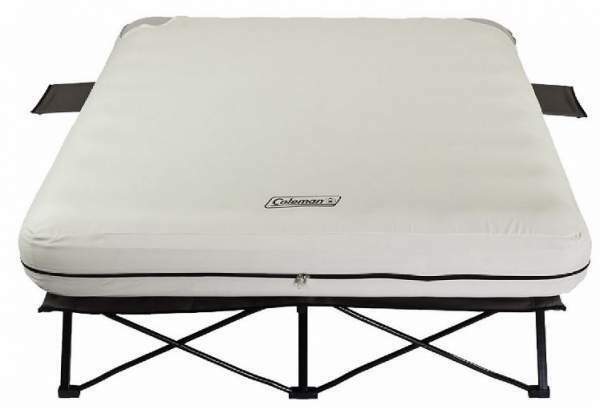 Coleman Queen Size Cot with air mattress. As the name suggests, this is a cot with an air mattress included, and it is a queen size tool. 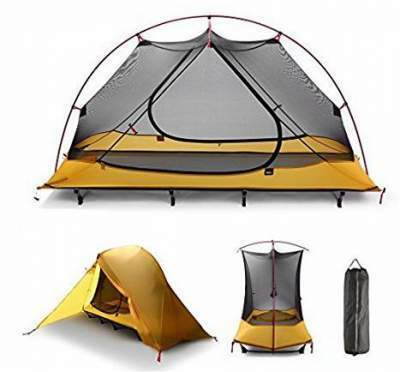 So this is a very luxurious option, suitable for couples and also for solo use, in a larger camping tent, see many great options here. In view of this, this system is for the case B.1. Everything is impressive in this system. Its dimensions are (L x W x H) 78 x 59 x 22 inches (198 x 150 x 56 cm), and its capacity is 600 lb (272 kg). The price is truly great, and you have side tables included, plus the pump which operates on batteries. Note that the cot can be used without the mattress, and also the mattress can be used separately. If this cot is too big for you, they have the twin size as well or check in the category of cots with mattresses. Please see more in my review. Perhaps you would not expect to see this type in the group for car camping because this is a backpacking cot. But remember the various situations mentioned above. So in view of this, the Desert Walker Camping Cot is a really versatile option and it can be used in all the situations A, B, and C.
You can definitely use it in any tent, literally, although it may not be the most comfortable choice of course. It will also fit in the car just like any other cot. But its best use is in the situation B.3. The reason is simple – this is the lightest camping cot on the market. It is only 2.6 lb (1.18 kg) of weight! The setup is incredibly easy, you have shock-corded legs and feet permanently attached to each other, and you can make it ready in just a couple of minutes. If you need a cot for any situation, this is it. However, its dimensions are not suitable for very tall people, you have (L x W x H) 73 x 23.5 x 6 inches (185 x 60 x 15 cm). 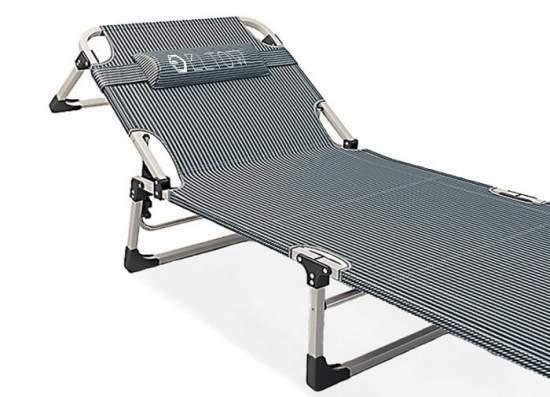 So if you are a tall guy, please check this Helinox Cot Max. Disc-O-Bed Large bunk bed With Organizers. As I mentioned above, this is about unique models and representatives of various types of camping cotes. 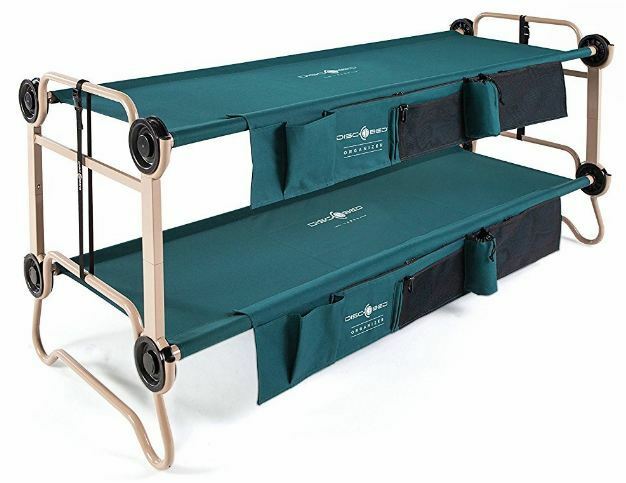 So this Disc-O-Bed bunk cot is something totally unique on the market although it is in the group of double cots here in the site as well as in the collapsible cots. So this is an incredible structure and nicely packable, and the dimensions of the beds are 81.75 x 32.25 inches (208 x 82 cm). This system is for the case A and you can use it in various ways as you see from the possible configurations above. You can also carry only one of the cots as well, and use it in the case B.1. for sleeping in the car. As the name suggests, this system comes with multiple storage pouches attached to each of the beds separately. The materials are high quality, the frame is powder coated anti-rust steel, and the deck is a 600 denier polyester. Observe that they build the version for kids as well and you can see it here. Eltow Portable Folding Camping Cot. This Eltow cot is one of those cots which you would transport in the car but you would sleep in the tent. This is a folding design so it takes space in the car, but it is thin when packed. The main reason for adding it here is its reclining design. 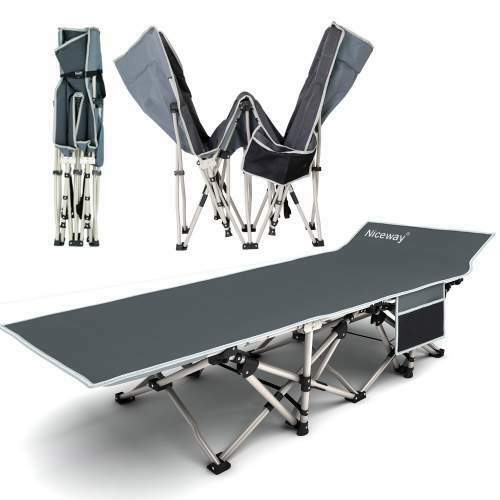 So you can use it with 5 different backrest positions as a chair in the camp. It comes with a carry bag included and you also have a pillow. The frame is steel, nicely built and very elegant. If you want to see some numbers, the weight is 17 lb (7.7 kg), the capacity is 350 lb (159 kg), and the dimensions are 75 x 27.5 x 12 in (190 x 70 x 30 cm). Please follow the link for more. This Eureka Cot is a new item on the marker, but the main reason for having it here in the list is its instant setup. You can literally have it ready in 2 – 3 seconds, and equally fast you can fold it. This is a type suitable for car camping also because of its construction, it packs nicely so it remains relatively large in one dimension only, the packed size is 38 x 8 x 7.5 inches (97 x 20 x 19 cm). Note that you have a carry bag included. The weight is 23 lb (10.4 kg) so this is not something to carry around, you would use this cot in a tent next to your car. The bed is very long, the dimensions are 80 x 29 inches (203 x 74 cm) so if you are a tall person, this is a cot to consider. iUcar Portable Camping Tent Cot. This is the most versatile option here due to the following reasons. You can use it as an option for the situation B.3 mentioned above, i.e. when you have to move away from the car and spend the night somewhere outside. This would be a tool for mountain climbers, hunters, kayakers. But this is also one of the options for the case B.1. This because you can detach the tent and use the cot alone in a larger camping tent next to your car. 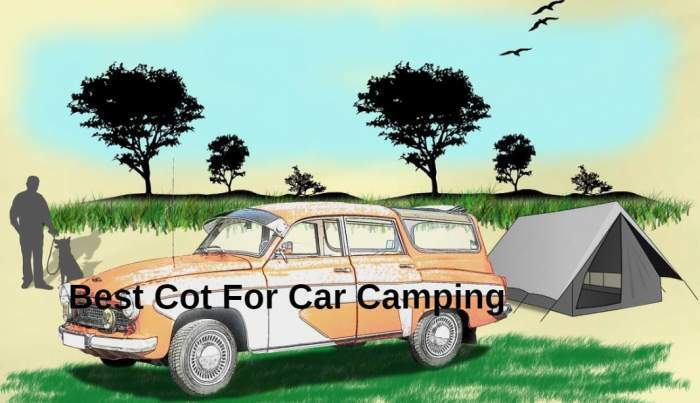 You can use it for the case B.2, this is a tent – so put it close to the car and you have a shelter to sleep. The cot alone can be used for the case A, to sleep in the car, and therefore this is the tool for the case C as well. So what you have here is a complete sleeping system, a net inner tent attached to the cot which protects you from bugs, plus a fly which offers protection from the rain. It is only 2.57 kg of weight for the whole system, and it is nicely packable. 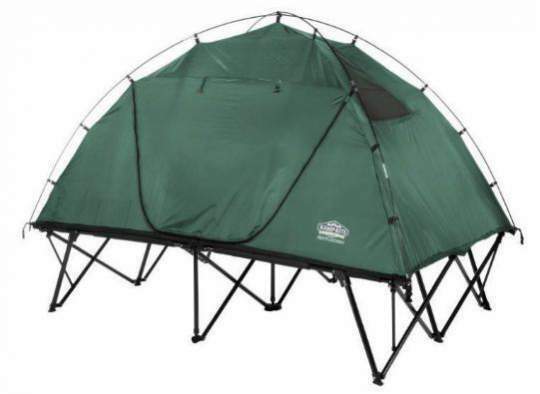 I have included it in my list of best backpacking tent-cots. This is a tent-cot system, so this is a tool described by the case B.2 above. With such a tool, you will sleep next to your car, you will be off the ground and fully protected, both from insects and from the elements. 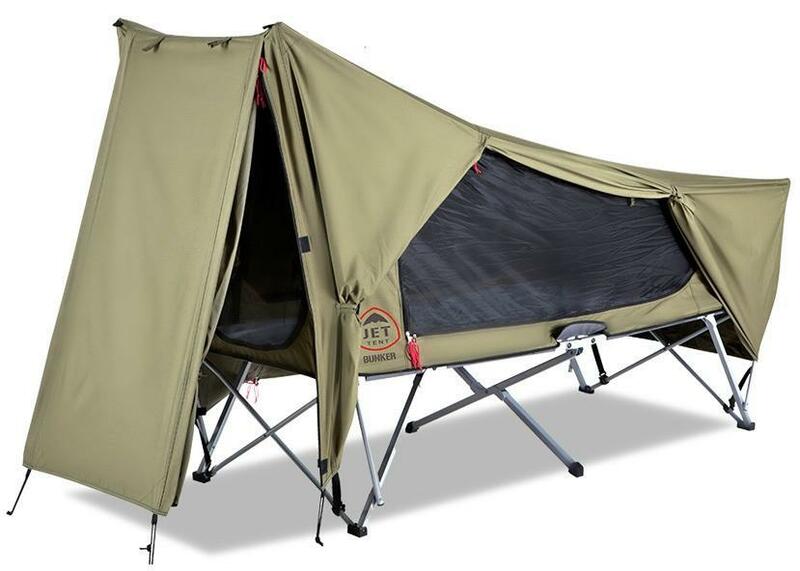 There are many single tent-cots of this type described in the site, so why I have chosen this particular model? Well, first I like it so much. You will realize why when you read my full review. This cot-tent is built from nice materials, so this is not synthetic. What you have here is poly-canvas fabric, a combination of polyester and cotton. So the fabric is breathable. But it has many other great features, like 3 entry points, gusseted vestibules so that you can store your stuff underneath the fly, it is a great size i.e. 2 meters long, it has internal pockets, very stable and reliable, with a very easy setup. But please see more in my full review. Note, if you are a particularly tall person, you might want to check this Kamp Rite Oversize Tent Cot which is 90 inches (229 cm) long. This is a double tent cot, and the reason for adding it to this list is obvious – if you are with your partner this is definitely the tool to consider. You have an impressive sleeping platform here, 85 x 55 inches (216 x 140 cm), quite a space for two people. So this is the tool for the case B.2. above. There is yet another good reason for having this tent cot here. This is a 3-in-1 system. The meaning is that you can use the tent (and the cot of course) separately. So if you make a tour and spend a night far from the car, you simply detach the tent and carry it as an ordinary hiking tent for two. Isn’t this a great design? This is currently the largest double size cot in the market. The cot has been on the market for several years already, it is very popular and it has stood the test of the time. As you realize form the title, this is a cot for couples, a large structure and probably unlikely to be used in a car. So this is a tool for the case B.1., i.e. for a tent used close to the car. Obviously, you will need a bigger tent, so if you have no idea where to look for such a tent, please check here. The bed size is (L x W x H) 85 x 55 x 19 inches (216 x 140 x 48 cm), so you realize this is a huge area and as such it takes lots of space in a tent. So use the fact that it is so high, you can store a lot of your gear underneath the cot. If you need something different please check among double cots here in the site. The main reason for adding this cot in the list is its headrest design and it is in the group of collapsible cots. So this is the feature that might be useful for some people as you can manage without a pillow. But there are several other great features here. This is also a cot without assembly, so you just spread it in all four directions like an umbrella. Its dimensions are (L x W x H): 74.8 x 27.6 x 19.3 inches (190 x 70 x 39 cm). Note, if the length is not good enough for you, please check this Stansport One-Step Deluxe Cot which is 203 cm long and also with the elevated headrest section. The construction is truly great with many legs (10 in fact) and support bars, a sturdy and reliable steel design. As you see from the picture, it comes with a useful storage pouch attached to the frame. Please see more in my review. 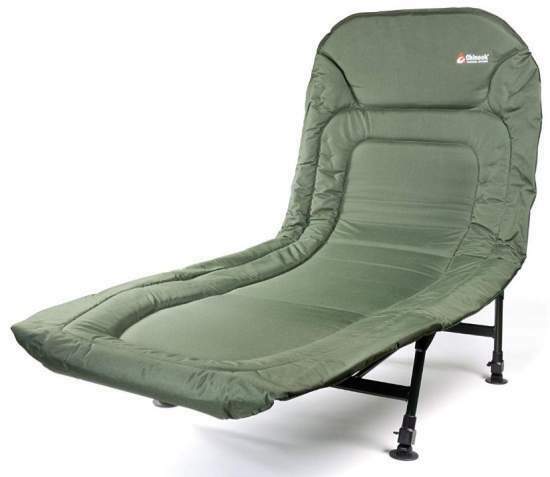 Teton Sports Outfitter XXL Cot. There is quite a number of reasons for having this extraordinary cot here in the list. This cot is the number one in the length-width-capacity combination. So you have (L x W x H) 85 x 40 x 19 inches (216 x 101.6 x 48.3 cm), and its capacity is 600 lb (272 kg). 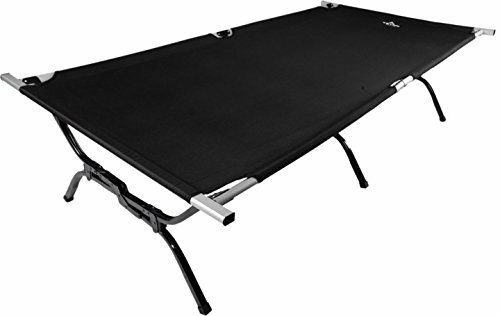 This is a sort of a military-type cot, so you have an extra strong X-shape structure with 3 pairs of legs, though one could say this is an S-shape to be specific. So the cot needs some simple assembly which only implies unfolding it and adding the two end bars, typical for all military-type cots. Yet another reason for having this great cot here is that it is used as a platform for the Teton Sports Outfitter Quick tent, so it serves as a platform for such a tent-cot configuration. So in view of all this, the cot presented here is a tool for the cases B.1., B.2., A, and C.
This Timber Ridge Camping Cot XL is a folding design with some extraordinary feature. So the head section is adjustable and reclining. The legs are also adjustable and the feet are pivoting so they adapt to any surface. 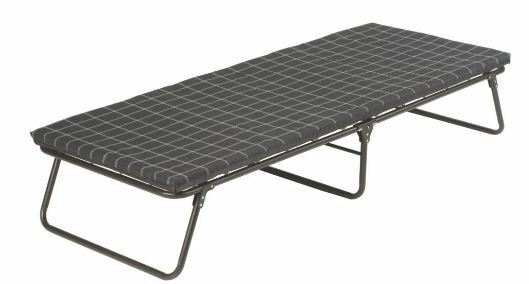 This is a fully padded cot so you do not need a pad for a 2-season camping. The frame is a steel frame and it comes with side storage elements that include a bottle holder and storage pouches. This is also a large cot with 81 x 29 inches (206 x 74 cm) bed size and 350 lb (159 kg) weight capacity. Please follow the link to read more. 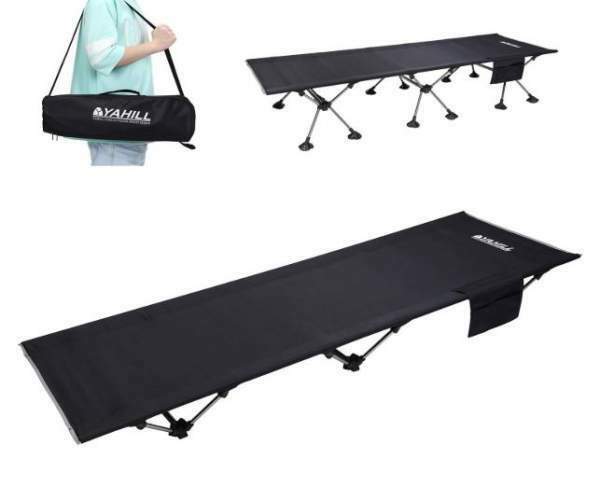 YAHILL Ultralight Folding Camping Cot. There is one particular reason why I have chosen to include this cot in the list and you can realize it from the pictures above. 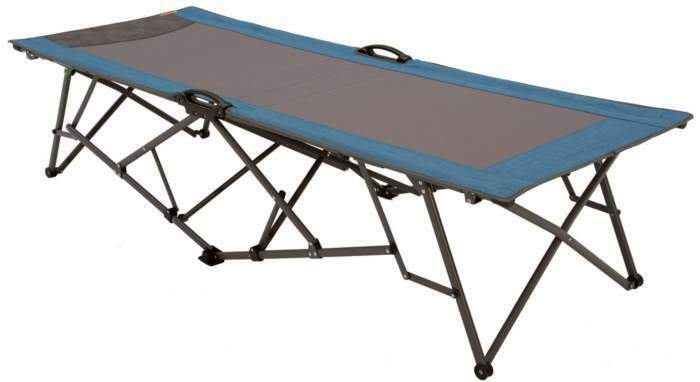 So this is a collapsible camping cot with extendable legs. 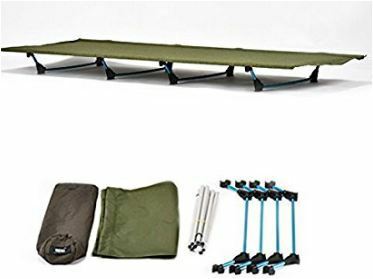 The practical meaning of this is that you can use it a rather tall camping cot when you sleep in the tent near the car, but you can also remove the extensions and use it as a low and lightweight backpack-portable cot if you make some short overnight tour away from your basecamp. You can see above how it looks when you remove the extensions. The bed size is 74.8 x 25.6 inches (190 x 65 cm) and the capacity is impressive 397 lb (180 kg). The cot is nicely packable and its carry bag is 20.9 x 6.3 x 4.3 inches (53 x 16 x 11 cm). 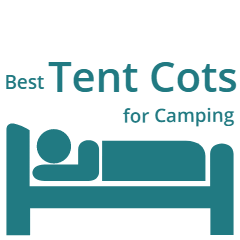 So those are my suggestions for the best cot for car camping, and I wish to stress again that this is not an arbitrary list. All cots here are representatives of various types, except for the Heritage wooden cot which is the only example currently on the market. Each of them belongs to certain categories here in the site and you have links where you can search for more if you want to find a better price or a different color option. With such cots, you might need the corresponding sleeping pads for car camping, so see some great options here. Thank you for reading. Please use the comment box below if you have any question or if you want me to include some specific cot in the list. I wish you a nice day.